The latest 13F reporting period has come and gone, and Insider Monkey is again at the forefront when it comes to making use of this gold mine of data. We have processed the filings of the more than 700 world-class investment firms that we track and now have access to the collective wisdom contained in these filings, which are based on their December 31 holdings, data that is available nowhere else. Should you consider Becton, Dickinson and Company (NYSE:BDX) for your portfolio? We’ll look to this invaluable collective wisdom for the answer. Is Becton, Dickinson and Company (NYSE:BDX) going to take off soon? The best stock pickers are getting less bullish. The number of bullish hedge fund positions were cut by 4 recently. 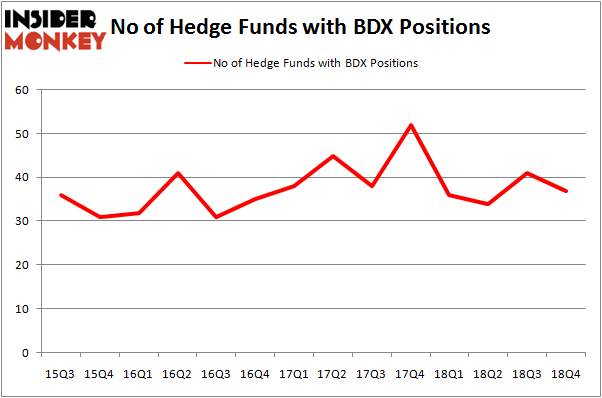 Our calculations also showed that BDX isn’t among the 30 most popular stocks among hedge funds. According to most market participants, hedge funds are assumed to be underperforming, outdated financial vehicles of the past. While there are over 8000 funds trading today, Our researchers look at the moguls of this club, approximately 750 funds. It is estimated that this group of investors have their hands on the lion’s share of all hedge funds’ total asset base, and by paying attention to their matchless equity investments, Insider Monkey has revealed many investment strategies that have historically outstripped the broader indices. Insider Monkey’s flagship hedge fund strategy outstripped the S&P 500 index by nearly 5 percentage points per annum since its inception in May 2014 through early November 2018. We were able to generate large returns even by identifying short candidates. Our portfolio of short stocks lost 27.5% since February 2017 (through March 12th) even though the market was up nearly 25% during the same period. We just shared a list of 6 short targets in our latest quarterly update and they are already down an average of 6% in less than a month. Let’s analyze the fresh hedge fund action surrounding Becton, Dickinson and Company (NYSE:BDX). At Q4’s end, a total of 37 of the hedge funds tracked by Insider Monkey were long this stock, a change of -10% from one quarter earlier. By comparison, 36 hedge funds held shares or bullish call options in BDX a year ago. So, let’s see which hedge funds were among the top holders of the stock and which hedge funds were making big moves. More specifically, Cantillon Capital Management was the largest shareholder of Becton, Dickinson and Company (NYSE:BDX), with a stake worth $236.7 million reported as of the end of September. Trailing Cantillon Capital Management was Sirios Capital Management, which amassed a stake valued at $104.4 million. Generation Investment Management, Alyeska Investment Group, and Adage Capital Management were also very fond of the stock, giving the stock large weights in their portfolios. Since Becton, Dickinson and Company (NYSE:BDX) has witnessed bearish sentiment from hedge fund managers, it’s safe to say that there lies a certain “tier” of money managers that elected to cut their entire stakes in the third quarter. It’s worth mentioning that Matthew Tewksbury’s Stevens Capital Management said goodbye to the biggest investment of all the hedgies tracked by Insider Monkey, totaling an estimated $23.3 million in stock. James Dondero’s fund, Highland Capital Management, also cut its stock, about $4.4 million worth. These transactions are intriguing to say the least, as aggregate hedge fund interest fell by 4 funds in the third quarter. Let’s check out hedge fund activity in other stocks – not necessarily in the same industry as Becton, Dickinson and Company (NYSE:BDX) but similarly valued. We will take a look at Biogen Inc. (NASDAQ:BIIB), Westpac Banking Corporation (NYSE:WBK), Chubb Limited (NYSE:CB), and China Life Insurance Company Ltd. (NYSE:LFC). This group of stocks’ market valuations resemble BDX’s market valuation. As you can see these stocks had an average of 24.5 hedge funds with bullish positions and the average amount invested in these stocks was $987 million. That figure was $909 million in BDX’s case. Biogen Inc. (NASDAQ:BIIB) is the most popular stock in this table. On the other hand China Life Insurance Company Ltd. (NYSE:LFC) is the least popular one with only 7 bullish hedge fund positions. 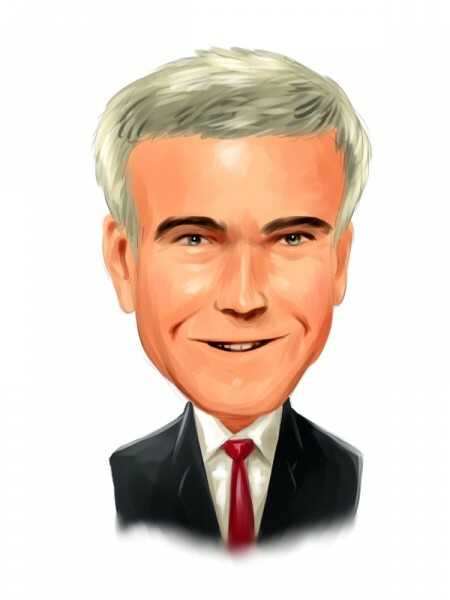 Becton, Dickinson and Company (NYSE:BDX) is not the most popular stock in this group but hedge fund interest is still above average. This is a slightly positive signal but we’d rather spend our time researching stocks that hedge funds are piling on. Our calculations showed that top 15 most popular stocks among hedge funds returned 19.7% through March 15th and outperformed the S&P 500 ETF (SPY) by 6.6 percentage points. Unfortunately BDX wasn’t in this group. Hedge funds that bet on BDX were disappointed as the stock returned 13.0% and underperformed the market. If you are interested in investing in large cap stocks, you should check out the top 15 hedge fund stocks as 13 of these outperformed the market. Itau Unibanco Holding SA (ITUB): Are Hedge Funds Right About This Stock? Were Hedge Funds Right About Dumping Twenty-First Century Fox Inc (FOX)? Were Hedge Funds Right About Buying Costco Wholesale Corporation (COST)? Do Hedge Funds Love Diageo plc (DEO)? Hedge Funds Have Never Been This Bullish On Thermo Fisher Scientific Inc. (... Were Hedge Funds Right About Buying United Technologies Corporation (UTX)?